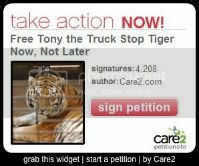 The Louisiana Department of Wildlife and Fisheries granted their permit to Michael Sandlin on December 14th, 2009 allowing him to keep Tony and continue exploting him as a roadside attraction at Tiger Truck Stop. This is an annual permit. Please voice your concern for Tony and your objections to the permit’s renewal by contacting the following individuals. Names highlighted in red on the list are suggested as key persons to contact regarding the permit renewal. Letters, e-mails and phone calls kept on point, factual and respectful have a better chance of receiving a response as do sending e-mails to one email address at a time rather than multiple recipients at once. Louisiana Residents: It’s very important for your elected officials, the LDWF etc. to hear from their own constituents. 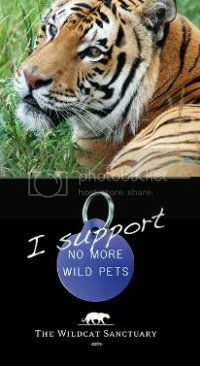 So please take a few minutes to write, email or call them to let them know a tiger used as a roadside attraction in your state is unacceptable. Mr. Mitchel J. Ourso, Sr.
* Mr. Edwin M. Reeves, Jr. was the only council member who voted NOT TO amend the ordinance. Mr. Eugene P. Stevens, Jr. Note: We were informed that “Tamra” is in charge of the weekly inspections that are suppose to be done at Tiger Truck Stop as part of the agreement Michael Sandlin made to obtain his Iberville Parish permit. The Iberville Animal Control Shelter Manager is Alison Migliacio and the director of Iberville Parish Animal Control is J. Mitchell Ourso Jr. who is also the Iberville Parish President. Brookshire Brothers no longer supplies wholesale gasoline in the state of Louisiana. ConocoPhillips is the supplier, while Brookshire Brothers LTD was the wholesale distributor (marketer) Please diregard their contact information. I just emailed every single person on this list. You need to do the same. ASAP. WE must not be silent and must continue to apply pressure at the local, state and federal levels. Don’t you care for this beautiful animal at all? How would YOU like to live in that cage for a month? I bet he wouldn’t be able to last that long. Finnish people are also very concerned about Tony and we wish him to move to the Big Cat Rescue as soon as possible. 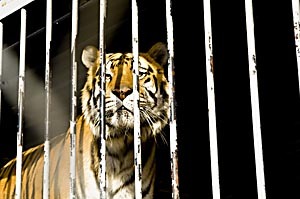 With what we know about tigers being endangered, it is a travesty that we are treating them as circus animals. It is bad enough that we have taken their habitat away, poached them for medicines and money and skins but now we cage them for our amusement. It’s not right, it’s not fair but I feel Tony will only survive in a santuary or zoo because of his interaction with people. We must support the cause everyone. The cause being to get Tony free in case you misunderstand me. There is a surefire way to get Tony freed. If everyone concerned with his languishing welfare, myself included, donated $50 to free him it would amount to a sizable amount of money. A couple of thousand people would bring in $100,000. I’m sure the guy who owns Tony would part with him for that much cash. After all, guys like that only care about money, that’s why he has Tony–he brings in money. With a hundred thou he’d probably be happy, Tony would be happy and we’d be happy. 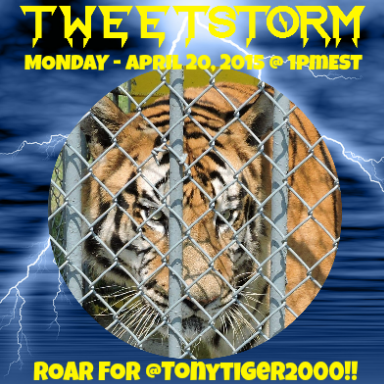 So how about somebody out there who is has more time on their hands than I do organizing a Rescue Tony Fund. Hollywood celebrities? Come on, cough up some of your easily earned residuals dough and donate it to free this tiger. And I mean FREE him–send him to one of the Indian parks for rehabilitation and release. Let the poor animal free immediately! 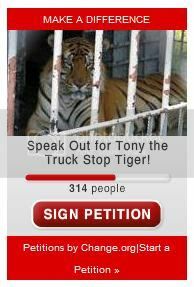 Free Tony, this is nothing but cruelty to a great animal. Let poor tony free NOW it is a big SCANDAL! In Sweden people are so upset about this and in Loisiana, we always liked your animalbehavior; but what is this!? Please explain for the swedish people and europe!